As the summer academic season winds down and preparations for the coming semester begin, I find myself reflecting on the incredible, but often unpredictable, experiences I’ve had these past few months since the debut of my own independent research project through the Mellon Mays Undergraduate Fellowship. Although choosing a research topic came easily, (I knew from the start that I wanted to focus on the ecology of bryophytes), determining which species to study proved to be a bit more difficult. For anyone unfamiliar with them, bryophytes are a group of plants that include mosses, liverworts, and hornworts. They are best characterized by having a predominantly gametophyte life stage and the ability to regulate an internal balance of water, similar to the way in which a kitchen sponge works. Even more fascinating is their relation to the earliest common ancestor of land plants! With a variety of interesting features to examine among bryophytes as a whole, I was even more determined to find an equally exciting study subject. Eventually with the help of my advisor, professor Jesse Bellemare, I formulated a project around the rather “charismatic” liverwort Bazzania trilobata. 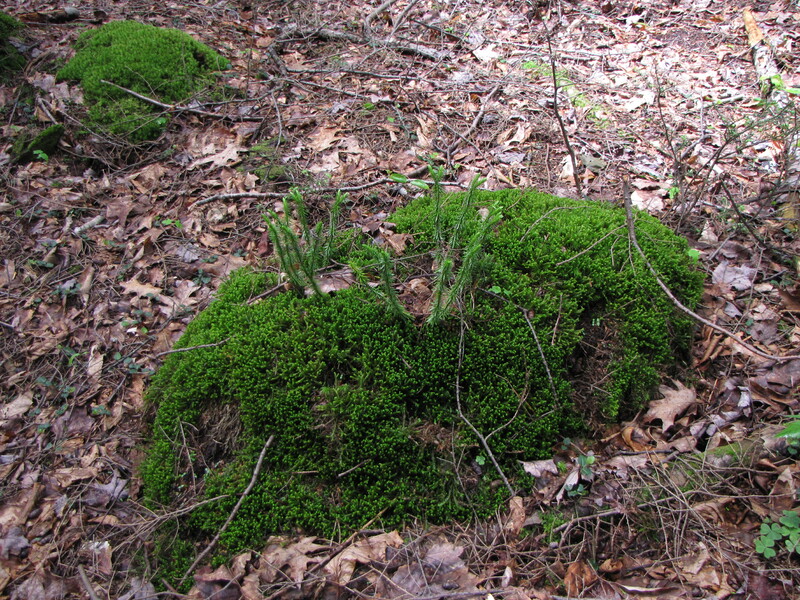 A rock covered with Bazzania and Huperzia at Harvard Forest. As far as my research specimen goes, my initial encounter with B. trilobata was essentially “love at first sight.” On a field trip prior to setting up my experiments, I recall walking into the hemlock forest-swamp unsure of what to expect and then seeing what can only be described as “carpets” of Bazzania all along the rocks and bases of trees. In my excitement, I managed to misstep in the swamp and found myself immediately stuck in the mud! As I struggled to get free, I ended up falling over and getting completely covered in muck. While that will certainly not be the last time I fall into the mud, it was a memorable experience made even more humorous when less than a month later during my actual sample collection, I got stuck again! This time my foot was lodged so far down in the mud that the suction created around it ripped my boot as I pulled it out. 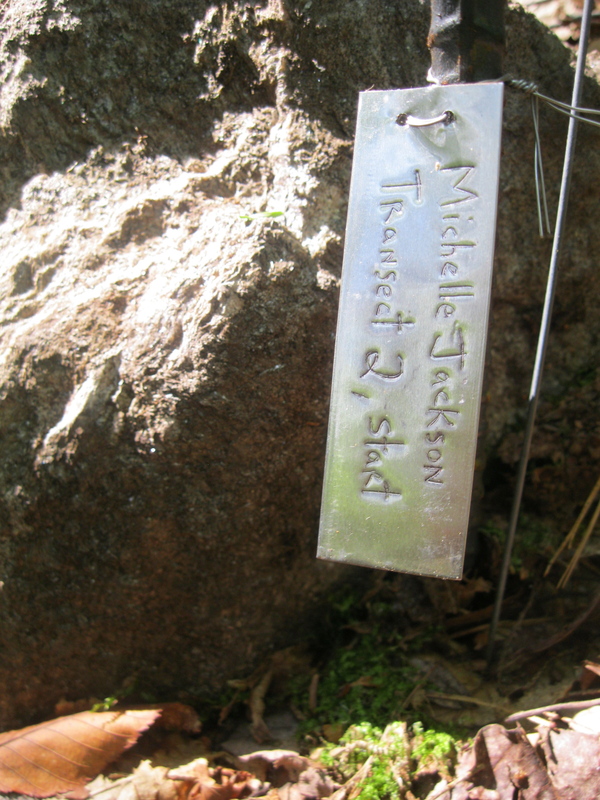 A transect marker at the MacLeish Field Station. The remainder of the summer has been filled with equally exciting experiences as I began to study how Bazzania trilobata is being affected by the the decline of hemlock trees (Tsuga canadensis) . (See Jenna’s July 3 post for more on the fate of the hemlocks.) Whether it was running out of landscape staples while setting up my transect, surprise rain showers while in the field, or various insects popping out of my samples (spiders and even grubs can be found in B. trilobata if you look hard enough! ), there was always some unforeseen event to make the day’s work more interesting than I had anticipated. 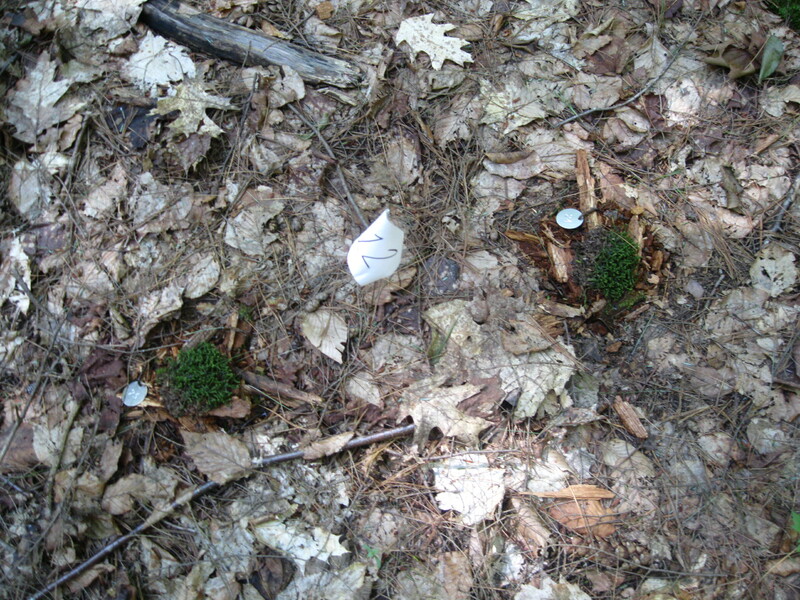 Bazzania samples in the leaf litter. Michelle is a Biological Sciences major and an Environmental Science and Policy minor. She is also a Mellon Mays Undergraduate Fellow. In her free time Michelle likes to watch new wave French films and cook Lebanese food.